Part of the training of every squire should be that they create their own sword! It builds character and teaches them the value of hard work. Well, you can make your own LARP sword with the DIY LARP Squire Sword Handle - Painted! Made from a cast polyurethane foam, this pre-painted LARP sword hilt resembles a traditional knights sword. The hilt possesses a slightly curved crossguard, a handle that resembles wood, and a slightly ovular pommel. The crossguard and the pommel have both been painted to resemble aged brass. Its durable construction is completely safe to use in LARPing events and has been approved by the top LARPing organizations. It also requires virtually no maintenance and will last longer than regular foam latex handles. 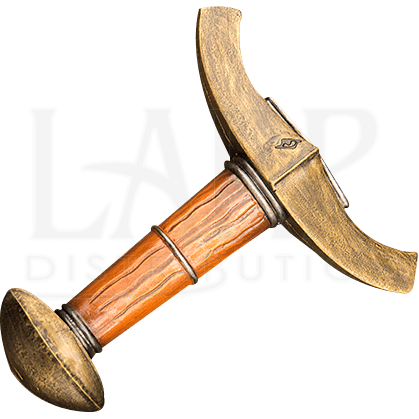 Begin your journey to knighthood by creating your custom LARP sword with this handle!